In the last week the events around one of the most important landmarks of Bremerhaven, the “Seute Deern”, dominated the reporting in the Nordsee-Zeitung and the discussions on Bremerhaven pages in the net. The “Seute Deern” belongs to Bremerhaven, just like the wind belongs to the dike. Last week I intervened in many discussions and made my position clear. The responsibility lies once again with the management of the German Maritime Museum(01). The pressure from the public on Prof. Dr. Kleingärtner as managing director must continue to increase. It finally requires a plan and a concept for the barque. Now is the time to show your colours. It is important that we Bremerhavenerinnen and Bremerhavener do not let up in it to show, which great importance the old lady has for us. We can provide our support in many different ways. At this point I would like to point out two projects that make it possible to show your own support. One thing is quite clear: The “Seute Deern” is one of the most important landmarks in Bremerhaven. The barque is the largest wooden freighter in the world, which has been preserved in its original state. It is located in the museum harbour of the Seestadt and is one of the magnets of the Havenwelten for many Bremerhaveners, Bremerhaveners, newcomers and tourists. Few ships have so many stories to tell. The last 100 years have left their mark on the “Seute Deern” and a fundamental restoration of the three-master is required. Arne Dunker, managing director and co-partner of the Klimahaus, had the idea for the charitable project. Certainly for the simple reason that his professional beginnings were also in the brewery business. The “SEUTE DEERN” red beer was developed together with Union Brauerei Bremen and is produced there. At the same time it is a local product, a means of identification with the Bremerhaven cultural monument and enables everyone to assume part of the responsibility for the continued existence of the “Seute Deern”. As red beer, the product is traditionally brewed with a high percentage of malt, produced locally in Bremen in the Unions brewery and bottled. I would describe the colour shade as copper and it is slightly cloudy. The taste is characterised by a fine bitter tone and is rounded off by a striking sweetish malt note. With an original wort content of 12.5° Plato and 5.5 % alcohol by volume, it is a rather light beer, but its taste is much harsher and heavier than one would initially expect. I would describe the taste as Northern German. A little bit peculiar, nevertheless tasty and with a high recognition value. In my opinion the taste is very suitable for a “Bremerhaven beer”. Where do I get the beer? The “SEUTE DEERN” red beer is available in practical and decorative four-bearers in the Klimahaus shop “8° Ost”, in selected shops such as the Bremerhaven sailmakers, various restaurants and in the museum shop of the German Maritime Museum. 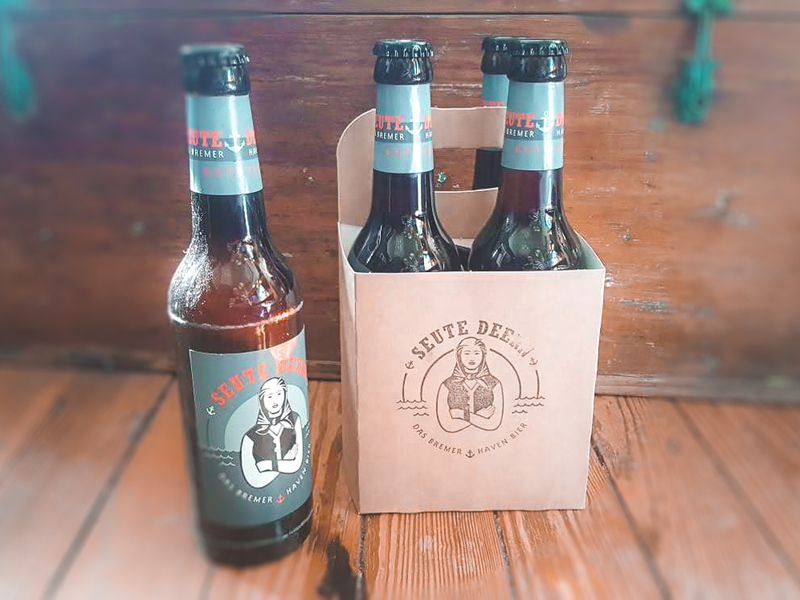 Although the beer has been around since the middle of 2018, I only came across it through the Facebook page “We love the SEUTE DEERN“. This lively community was founded on Saturday after the fire on the initiative of Eva Erkenberg. As of today(02) 659 people already like that. Let’s expand the circle of supporters together. Visit us, recommend the site and participate with pictures and personal stories about our beloved “Seute Deern”.